The Life of my Pens!! Yesterday morning, I awoke and was getting prepared to leave the house, I kind of like my things very organized and perfect in their little places. While packing up my pens and biros, I noticed one had a broken tip and another had not been working well, so I took the two and was going to throw them in the bin, just as I was about to bin it, a thought came to my head, ‘is it necessary you throw both away’, can’t any be fixed? So I paused looked at them and viola, I removed the tube ink in the spoilt case tip and put in the other with the bad tube ink. So i thrashed one and got the other in great condition. We have issues in our lives like this all the time, we don’t think twice about matters when they come up, we just thrash it all and move on hoping to get a better solution when mostly, the solution is right in front of our eyes. Even in our relationships, do we think twice before making tough decisions or we just thrash the other and move on, hoping to find or get a new one in perfect condition. 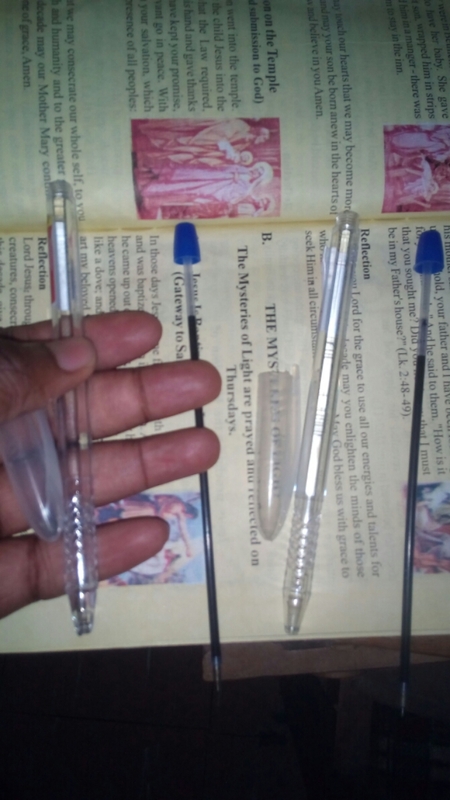 When faced with challenges in life, we forget the fact that, both pens were in great condition at the start of their journey, but got damaged on their road to victory, all they needed was a little fix to make one better. Next Control your Time, Don’t let it control you!! What are you Neglecting? Thank you Antonio. I’m flattered. You have quite a knack to draw big lessons from little things. Thank you…xoxo. Like its said, a drop of water makes an ocean, so little things in our lives make up who we are. Lol.